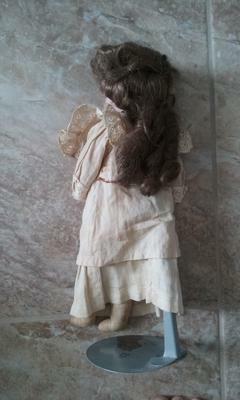 Antique 13" bisque doll marked "Germany 13/o" value? Although we have found other dolls that look similar online, we have yet to find one just like it. The price range seems to be rather broad for similar dolls. 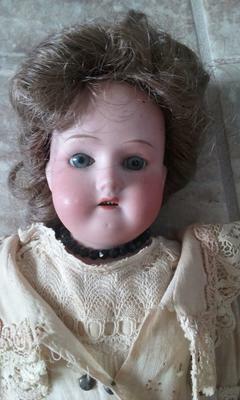 five teeth, rosy cheeks, bisque lower arms, fabric lowest portion of legs & feet, wigged brown curls, dimple on chin. Doll is wearing a dress with a matching jacket with a lace collar and double buttons down the front. She also has a black bead necklace with no fastener. 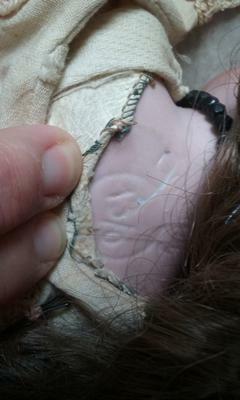 The fabric is yellowed with seeming rust markings around the back of the waist wear a previous doll stand must have been. There is a 1 inch hole in the fabric along the same rust marking. Everything else is in tact. The hair has a few bobby pins holding curls in place. All of this is exactly as it was received to us as a gift several years ago. 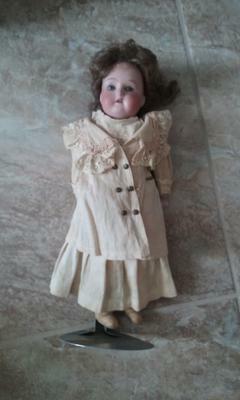 Comments for Antique 13" bisque doll marked "Germany 13/o" value?